The Guess the 150th Country Blog Contest is now officially over. We have a winner! At 11:22 this morning, I had my first visit from the country of El Salvador. Ego guessed El Salvador back on February 2, so Ego, you are the winner of the $25 Amazon gift certificate. (I will email you separately just in case you miss this post.) I have now had visitors from 151 countries — only 43 more to go! Thank you everyone for playing and for visiting the blog. But if you want to participate, you better hurry. As soon as the 150th country visits, the contest is over. Blog Contest: Guess the 150th Country! Hi! Welcome to RayFowler.org and the “Guess the 150th Country” blog contest! It’s easy, it’s fun, and it costs you nothing to enter. 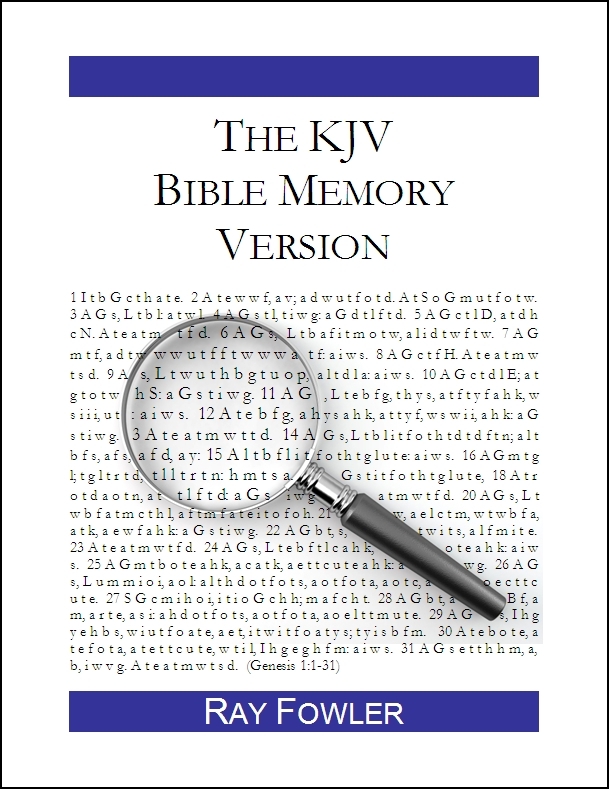 While you are here, feel free to browse the Archives Page to get a feel for the site. If you enjoy your visit, be sure to bookmark the site or subscribe by email or feed reader so that you don’t miss any future posts. The Contest: I have been keeping track of how many different countries have visited this site since I first started blogging last March. As of today I have had visitors from 149 countries. I ran a similar contest last September when we approached the 100th country mark, so I thought it would be fun to revamp the contest, only this time it is: Guess the 150th country to visit my blog! Respond with your best guess in the comments section. One guess allowed per person. When a visitor from the 150th country visits the blog, I will check the comments on this post to see who named that country first. I will notify the winner by email and post the winning entry on the blog. Before you guess, be sure to visit the Stats page first to check which countries have already visited. Also before you guess, be sure to check the comments other people have already left to see if someone already guessed a particular country. That’s it! I believe there are only about 40 countries remaining, and I don’t know if they all have internet access, so go ahead and guess while you can. You can find a list of all the countries in the world at the Fun Facts link below. Fun Facts: How Many Countries In The World? Now that is a question that’s somewhat difficult to answer, as there is no one right answer. Many sources offer different answers, and depending on the source, there are 189, 191, 192, 193 or 194 independent countries in the world today. Blog Contest: Guess the 100th Country! Hi! Welcome to RayFowler.org and the “Guess the 100th Country” blog contest! It’s easy, it’s fun, and it costs you nothing to enter. While you are here, feel free to browse the Archives Page to get a feel for the site. If you enjoy your visit, be sure to bookmark the site or subscribe by email or feed reader so that you don’t miss any future posts. The Contest: Just for fun I have been keeping track of how many different countries have visited this site since I started blogging in March. Today I had two new countries pop up in the stats: Namibia (country #98) and Chile (country #99). So, I thought it would be fun to run a little contest: Guess the 100th country to visit my blog! When a visitor from the 100th country visits the blog, I will check the comments on this post to see who named that country first. Be sure to visit the Stats page first to check which countries have already visited. Be sure to check the comments others leave before you to see if someone already guessed a particular country. That’s it! Have fun, and may the best country-guesser win! The winning entries from the Clever Blogging T-Shirt Contest are now available for purchase. You can read about my major award here. Here is a sample of my winning entry on a men’s baseball tee. Here are some links if you want to see some of the other designs. 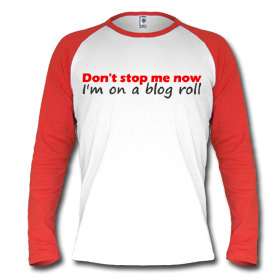 My winning t-shirt slogan was this: “Don‘t stop me now, I‘m on a blog roll.” You can check out the other winning entries here. My prize? Thank you, Sarah, for running such a fun contest and for providing such an excellent blog for your readers! And thank you, Tennille, for the great prizes!